I have composted fruit and vegetable peelings for decades, but I never thought about the stickers that are often stuck on the peelings. I assumed they were paper, and didn’t worry about removing them. 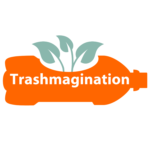 But I just learned that these stickers contain plastic, and are considered contamination in industrial composting programs. The stickers might seem like an insignificant source of trash, but it adds up. A grocery store in Sweden stopped using stickers on their avocados, and a representative said that represented “135 miles of plastic about a foot wide” in just one year. That’s one country and one type of sticker. Imagine how many fruit stickers there are in the world! In today’s podcast episode, get lots of fun ideas for what you can do with your fruit stickers! 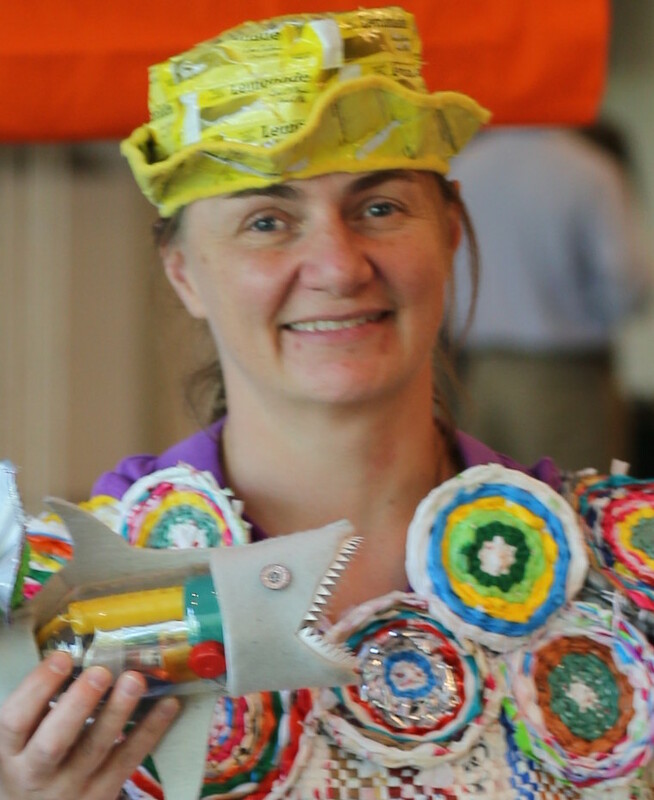 Genny Rietze from HelloZeroWaste is a zero waste enthusiast in Alaska. All through 2018, she needs people to send fruit stickers so she can make a wearable art project. She suggests you put the stickers on wax paper to make it easier for her to unstick them. Her address is Genny Rietz, PO Box 28, Haines, AK 99827. Barry Snyder has a website called Stickerman Product Art where he makes art from fruit stickers. His address is Barry Snyder, PO Box 301, Erie, CO 80516. Take a “fruit sticker selfie.” – This was an idea put forward during Nutrition Month last year by Australian Jennifer Howard. She encourages people to wear stickers from the fruit you have eaten to spark conversation and she invented the hashtag #fruitstickerselfie. I like Jennifer’s campaign because as we know, there are communities where it is challenging to get fresh fruit. I live near Washington DC and there are parts of the city with almost no grocery stores. Use fruit stickers in your bullet journal – Check out this videos on Instagram of a bullet journaler saving fruit stickers. Use fruit stickers in a sketchbook – There is a book called Wreck This Journal that has a page where it encourages you to collect fruit stickers. 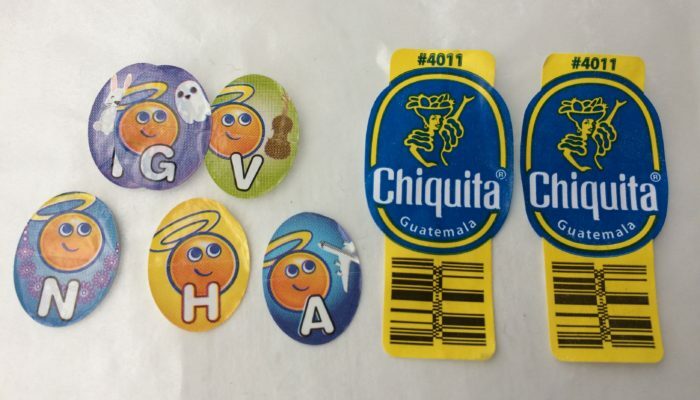 Teach kids about nutrition – You can use fruit stickers to teach kids about nutrition. There are many downloadable fruit and vegetable activity sheets. Sometimes fruit stickers are incorporated in a Bible School lesson based on that verse from Galatians. Or check out this cute activity with a fruit peacock by Kathrin Jebsen-Marwedel where the body was made from a pear drawing and the tail feathers were places to put fruit stickers. Collect and trade fruit stickers globally – There is a word in French to describe fruit sticker collecting, which is “Légufrulabélophile”. There is an international community of fruit sticker collectors who trade back and forth. TED Radio Hour podcast episode called The Power of Design – Fruit stickers are an example of poor design but it wears us down until we don’t notice the poor design anymore. Amron’s Vanishing FruitWash stickers – dissolves to become a produce wash which helps remove wax, pesticides and bacteria. Cedar Grove Composting in Everett, Washington, encourages people to remove fruit stickers by giving a free bag of compost when you fill a card with stickers. Stefano Fiorina covered fruit with fruit stickers and then photographed it. He then printed the images as giant stickers he stuck around the walls of his city. Fruit Stickers: 2017 Year Planner from The Pop-Up Pinhole Co. on Vimeo.